Join the UTA Wind Symphony as they present their final concert of the year. 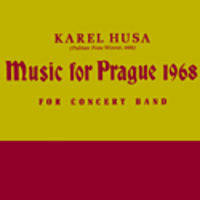 We honor the 50th anniversary of Karel Husa's Music for Prague, one of the most important works written for band. Music for Prague, Husa's response to the violent suppression of freedoms during the 1968 Prague Spring, encompasses the full range of emotion possible in concert band music. Also on the program is Robert Russell Bennett's delightful Suite of Old American Dances and Aaron Copland's stirring Fanfare for the Common Man.